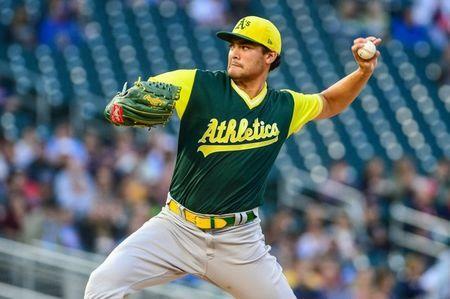 Oakland Athletics left-hander Sean Manaea will undergo arthroscopic surgery on his left shoulder, a procedure that might cost him all of the 2019 season. Manaea will have the operation on Sept. 19, the A's announced. The team said further details will be provided upon completion of the surgery, though manager Bob Melvin hinted the southpaw could be sidelined a full year. "I think the specifics we'll talk about moreso after the surgery so we know exactly what was repaired," Melvin told reporters, "but unfortunately, it's another one we're going to have to wait basically a year for, and we really and truly feel more for him." Manaea, 26, was placed on the 10-day disabled list with rotator cuff tendinitis on Aug. 26. Prior to the injury, he was 12-9 with a 3.59 ERA in 27 starts this season. Manaea likely would have been the Athletics' starter in a winner-take-all wild-card game or Game 1 of a division series. The A's are 87-57 entering Tuesday, three games back of Houston in the American League West and 7 1/2 games up on Seattle and Tampa Bay for the league's second wild card. "He was that guy that every series, when teams played us, they're looking to see if Manaea's pitching in the series," Melvin said. "That's what your top guy means to you. Again, I feel worse for him. We'll find a way to manage around it." The A's are no strangers to losing starters this season, with Jharel Cotton, Kendall Graveman, Daniel Gossett all undergoing Tommy John surgery that will sideline them into next year. Top prospect A.J. Puk also had the operation. Manaea is 31-28 with a 3.94 ERA in his three major league seasons. He threw a no-hitter against the Boston Red Sox in April. The A's also announced a roster move on Tuesday, recalling right-hander Frankie Montas from Triple-A Nashville. Montas, 25, joins Oakland for his fourth stint this season. He is 5-4 with a 3.96 ERA in 11 starts with the Athletics.